Having worked in some of Washington, DC's finest restaurants and hotels, we took an impromptu vacation to Maine. While here, we talked our way (and each other) into taking over a restaurant far Downeast, and fell in love with Maine. Inspired and excited, we began the search that landed us in Bar Harbor. We are thrilled to be the newest stewards of the Atlantean Cottage and are looking forward to hosting you in this uniquely fantastic place. Join us on this beautiful island, surrounded by the rugged beauty of Acadia and the North Atlantic. Atlantean, as built, was well suited to its current use as a bed & breakfast. The layout of the house provides extensive public space for guests, both inside and outside. The spacious drawing room provides plenty of room for numerous guests to gather, read by the fire or a enjoy a game of scrabble. Likewise there are many seating options outside, on the front porch and in the expansive garden. The comfortable breakfast room features tables for two each morning. 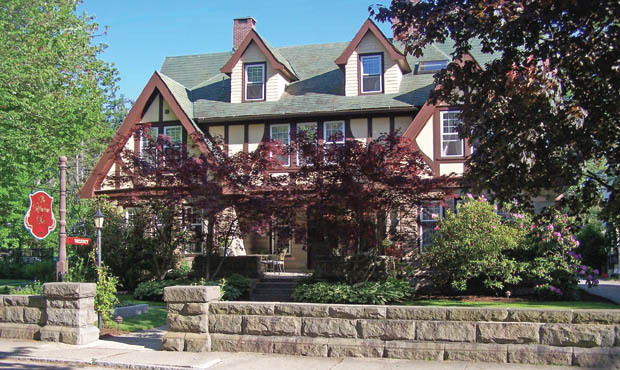 In 1903, famed Bar Harbor architect Frederick L. Savage built Atlantean Cottage as his personal residence, fronting on leafy Atlantic Avenue, one of the prettiest residential streets in the village. The lovely Tudor Revival home featured artfully crafted massive granite block in the construction of its first floor and buttressed front terrace, as well as the imposing wall along the front of the property. The stone came from the Bear Mountain granite quarry, owned by George B. Dorr, the "Father of Acadia", for whom Savage managed the quarrying operations. The upper story walls were constructed in the half-timbered style, with stucco infill between the gracefully curving timbers. Broad overhangs and steep, sweeping rooflines of complex yet harmonious configuration with enormous timbered gable ends visually reduced the considerable size of the mansion. The oversize entry opened to a large and elegant reception hall with a prominent fireplace and imposing central stairway of unusually gradual rise and wide tread. Accessed from the reception hall were the large drawing room on the east side and formal dining room on the west, each with its own fireplaces. Savage's study, also fireplace equipped, occupied the rear of the house behind the drawing room, and the house's large kitchen was located opposite, behind and separated from the dining room by a beautiful and functional butler's pantry. A large piazza wrapped the back eastern corner of the house, connecting the drawing room with the study, and comprised of a large area inset to the granite block work plus a broad covered porch extending from the back. At the back western corner was a servants' dining room located off the kitchen, arranged to be symmetric with the porch opposite it. Five bedrooms occupied the second floor, varying considerably in size from the roughly twenty foot square central room at the front of the house, to the still comfortable fourteen by ten foot room at the back of the west side. Four of these rooms had their own fireplaces, bringing the house total to eight. Two bathrooms, one at each end of the broad central hallway, serviced the second-floor bedrooms. The deceptively large third floor was the servant's living quarters, with five bedrooms, one bath, and a large storage room The attic of the great house had a very large, copper-lined cistern fitted under the rafters, to ensure impressive water pressure for the copious amount of turn-of-the-century modern plumbing. The third floor was reached by a back stairway, less formal than the front, and intended for service use. As such, it wound down from the servant's quarters to a landing off the second floor hallway, thence to the kitchen's back pantry, thence to a rear service entrance to the house, and finally to the laundry facilities in the extensive basement. Today, Atlantean Cottage is very little changed from Frederick Savage's original design. Although he has been gone more than eighty-five years, we like to think he would immediately recognize his home, feel very comfortable, and approve of the sensitive and thoughtful updates which have been undertaken to convert the house into one of Bar Harbor's favorite B&B's. 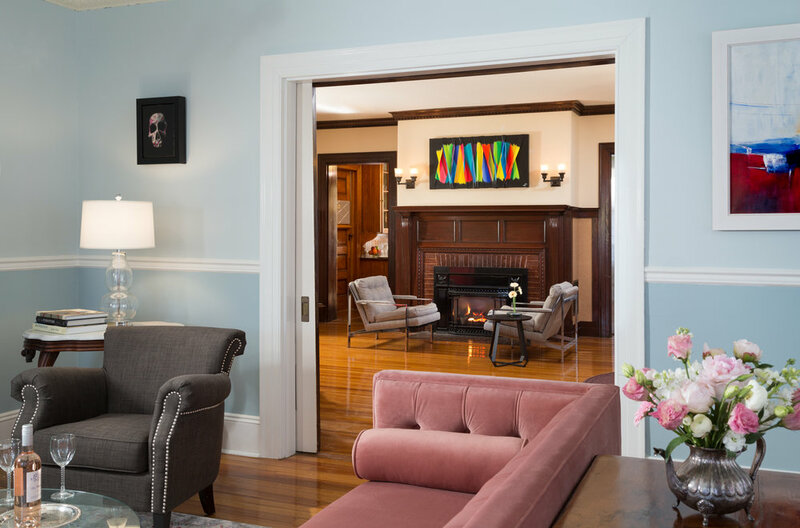 All the elegant first-floor rooms are as they then were, save for some inevitable alterations of wall surfaces and considerable modernization of utilities. Our amazing breakfasts are enjoyed in the Savage family dining room, and the butler's pantry is now used by our guests for beverage and snack service round the clock. Savage's study is the most changed of the first-floor rooms, having become an elegant and spacious guest room with a fabulous bath occupying a portion of his piazza, while the rear porch portion is used exclusively by the this room's guests. The second-floor guest rooms are luxuriously finished and appointed, and all have private baths en suite, some simple and cute, some large and dreamy. Without a small army of live-in servants, Atlantean's third floor now features two roomy suites with huge baths. These are especially appreciated by those on extended visits due to the convenience of a separate sitting room in each. Behind the scenes, we suspect that Atlantean's original cook would be quite startled by the gorgeous modern kitchen which still manages to retain so many aspects of the original. And the replacement of the servants' dining room by comfortable living quarters for your humble innkeepers would probably be accepted in good humor by those who once occupied the "back of the house". Atlantean Cottage is a very important part of Bar Harbor's architectural and social history. Its preservation and beauty today are due entirely to the fact that it can be used as a vital business thus supporting its maintainance and ongoing restoration and modernization. Historic homes are seldom viable as private homes today, and the rebirth of Atlantean as a premier B&B for accommodating discriminating visitors ensures its continuing prominence in this historic village. The brilliance of Frederick Savage's vision and design has made this possible. We've switched nearly all of our 300+ light bulbs to efficient LED bulbs. We ask guests to do their part by turning lights off when departing their room. We recycle anything we possibly can! Soda cans, water bottles, wine bottles, newspapers, magazines…. We ask guests to either leave them in their room or the butler's pantry…we'll take it from there. The sink in the butler's pantry has been fitted with a .5-micron filter for really tasty cold water. Laundry is a tremendous drain on energy and water resources. Here at the Atlantean, we launder our linens in-house cutting out the harsh chemicals, inefficient machinery and transportation needs of a commercial laundry. Also, during your stay, we will not change your towels if they are hung up. We'll assume you'd like to reuse them. Likewise, sheets will be changed every three days, unless you request otherwise. Be sure to walk the carriage road around Eagle Lake, our reservoir. It will thank you for your efforts. We support local businesses with strong environmental practices. Our morning coffee comes from 44 North Coffee in Deer Isle Maine. For breakfast food, Native Maine Produce is our chief source. We try to hit the local farmers markets to round out our menu. Our winter activities revolve around renovation. Each project we take on is geared toward a more energy efficient house. All of our appliances have been replaced with high-efficiency, Energy Star compliant models. As of the 2019 season, all of our guest rooms now benefit from individual, ultra-efficient heat pumps for heating and cooling.